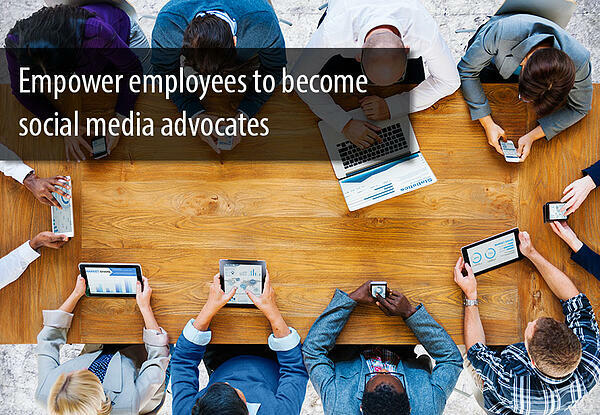 Let your employees leverage social media to grow your business. Check out this social media advocacy SlideShare to help them get started. Social media is a tremendous resource for companies to develop brand awareness, promote products and events, provide customer service and technical support, and to recruit top talent within a specific industry. 90% of those surveyed reported that their social media efforts generated more exposure for their business. Increasing traffic to their websites was the second major benefit, with 77% reporting positive results. More than half of the businesses that have been committed to using social media for at least two years indicated a direct improvement in sales. Regardless of the data, however, the thought of allowing employees to become brand advocates on social media still makes some employers and managers squeamish, a feeling similar to handing over a set of car keys to a new driver. Rather than sending employees out for a joyride with your brand, educate them with some basic guidelines, expectations, and potential rewards for driving positive social media interactions. To get started, share this guide with your employees so they can learn how to be effective social media advocates on LinkedIn and Facebook. Social Media Advocacy 101 from Denamico Inc.
Recognizing that your employees are the people behind your brand can pay dividends online in terms of reach and engagement. Armed with a social media strategy and implementation plan, you can avoid the uncertainty associated with turning employees into online brand ambassadors. Are you working on a social media strategy? We can help you connect social media to lead generation and sales. Schedule a consultation today!